Every day this Advent we will be sharing reflections from Christian authors. Today's is by Andy Frost. Each morning my children hurry downstairs to open the next door on their advent calendar. It’s great to watch their excitement as they countdown to Christmas. They’re excited about being together with the wider family - aunts, uncles, cousins and grandparents. They’re also excited about donning angels wings and shepherd’s costumes to perform in Christmas nativity plays. And, of course, they’re pretty excited to open some presents. They also realise that Advent is about preparing ourselves for Christmas. They are aware that it’s a time to remember that just over 2,000 years ago, Jesus entered the broken-ness of the world as a baby. Emmanuel - God with us. That moment that changed the entire trajectory of human history. But one thing that they have been unaware of, is that Advent isn’t just about remembering that Jesus came into the world but it’s also a reminder that Jesus will return. We look back to Jesus as a baby but we also look forward to Jesus, returning as a judge, to redeem all creation. Traditionally, in the ecclesiastical calendar, we make a great fuss over Advent being about the return of Jesus but somehow, we fail to communicate this to the world around us. Most non-church goers know the nativity story but have little understanding that Jesus promises he will be back. And that’s got me thinking, why is it that we don’t talk much with our friends about the return of Jesus during this Advent time? Perhaps, the fantastical end-of-the-world Hollywood movies mean we are afraid of looking a bit weird. Perhaps, the different theological perspectives on exactly how things will play out, leave us a little confused as to what to say. Or perhaps, we are just so busy living in the moment that we haven’t given the second coming more than a momentary thought. In my latest book, Long Story Short, I share the importance of framing our lives with the God story that we find in Scripture. As Christians, we find the best story for our lives when we frame our existence in God’s great redemptive narrative. And the second coming of Jesus is a key part of that story. The fact that Jesus will return gives us hope despite news headlines about disasters and wars. The fact that Jesus will return helps us persevere through hardships because we know that God has not given up on his creation. The fact that Jesus will return also challenges us to invest the precious gift of life, that we have been given, into Kingdom living rather than chasing after the things that are only temporary. 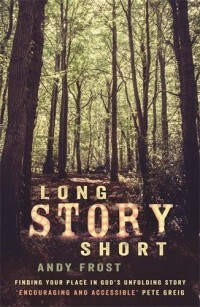 Long Story Short by Andy Frost: 'The universe is made of stories not of atoms,' said American poet Muriel Rukeyser. Whether you agree with this sentiment or not, the fact is: your life tells a story. From beginning to end, your life will create a unique narrative, shaped by the wider stories you find yourself living in. So what story are you living in? Exploring the importance of such stories and how these shape our identity, Share Jesus International's Andy Frost humbly presents the ultimate narrative of life, the universe and everything: the God Story.